Are children playing less than they used to? Are rising obesity rates linked to a decline in children’s time to play freely? These and other related questions have filled the pages of newspapers, magazines and scholarly journals for the past decade. Researchers and journalists have attributed these issues to societal changes around children’s lives and leisure, the growth of structured and organised activities and increasing perceptions of risk in children’s play. Play, Physical Activity and Public Health presents a discussion of the way modern notions of play are rendering children’s leisure activities less free and less engaged in simply for fun. Based on original qualitative research, and analysis of contemporary media from Canada and elsewhere, this book argues that the growing health concerns around childhood play entail a paradox: by advocating, promoting, discussing, and re-directing children’s play, a new form of children’s leisure is emerging - one that is purpose-driven, instrumentalised for health, and ultimately, less free. 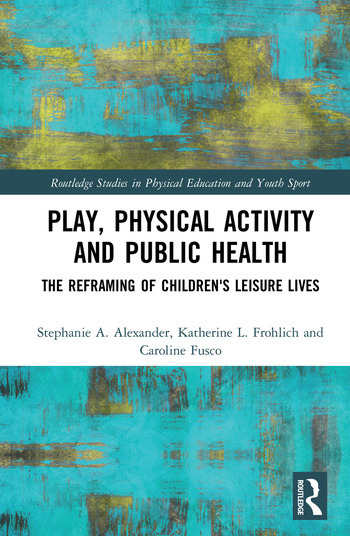 We explore how play has become goal-oriented, a means to health ends, and how the management of pleasure in play as well as diverse risk discourses around play continue to limit and constrain possibilities for children and families to play and engage in leisure freely. Incorporating past critiques of this trend in play, we argue for research and practice to create new possibilities and ways of thinking about children's play, leisure, fun and childhood, that are less constrained and managed, and importantly less geared towards health goals. This is a valuable resource for students of the sociology of sport, kinesiology, sports and health psychology, education, public health, and childhood studies. It is also an important read for school teachers, public health practitioners, psychologists, physical education teachers, academics and parents interested in how children’s leisure lives are being shaped by the growing and diverse discussions around play. Stephanie A. Alexander is Post-doctoral Fellow at the Collège d’études mondiales in Paris, France in the Chair Anthropology and Global Health. Her research involves critical examinations of interventions on children’s play and physical activity to analyse how play may be reshaped when it is promoted for health purposes. Her current research examines questions about the globalisation of concepts such as ‘active play’ and of assumptions about childhood and health that underlie physical activity interventions. Katherine L. Frohlich is Professor with the Département de médecine sociale et préventive within the École de Santé Publique at Université de Montréal (ESPUM), Canada as well as Research Associate with the Institut de Recherche en Santé Publique at Université de Montréal (IRSPUM). She is Director of the Masters Programme in Public Health at ESPUM. Her current research interests include social inequities in health-related practices, the sociology of smoking and the playability of urban spaces. Caroline Fusco is Associate Professor in the Faculty of Kinesiology and Physical Education at the University of Toronto, Canada. She favours poststructuralist, feminist and cultural geography theories and her work is grounded in the pursuit of ethical relations, equity and social justice. Her current research interests centre on the cultural landscapes of play, youth and ecologies of urban recreation, intersectional studies of sport, sexuality and space, and she is most passionate about bringing a critical animal studies lens to the disciplines of kinesiology, recreation and sport.